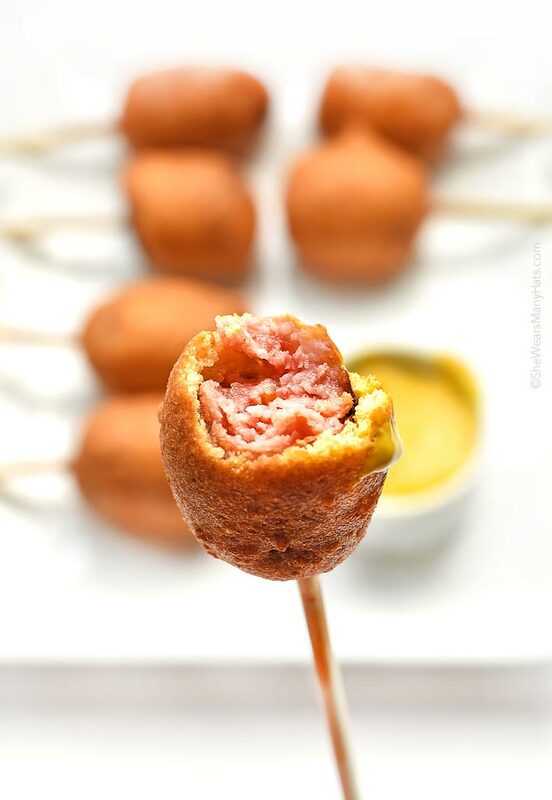 These Smoked Sausage Corn Dogs take corn dogs to another level of greatness. If you like corn dogs, you’ll be smitten with this tasty version. Yes, smitten indeed. Yep, I’ve been on a little fried food jag this week. No worries. There are more healthful things to come, but for now, let’s talk about corn dogs a little—or rather, little corn dogs. These corn dogs may be little in size, but they are mega big in taste. You know why? Because we replaced the regular hot dog with smoked sausage that’s why. Oh yeah … we’re getting all crazy up in here! Not that this is an original idea. I’m sure if I Googled it (but I won’t) I’d find an array of corn dog creations on the internets. No original ideas, and all of that mess … whatever. This combo is new and original in our home, and really, that’s all that should matter to us. Back to the corn dogs … after making Corn Dogs last weekend, we had a bit of leftover batter, along with a package of smoked sausage that needed to be used, so we did what any normal southerner would do, we battered that sucker up and fried it. And it was a good thing. These are easy to make. Slice smoked sausage up into pieces, then broil them on a baking sheet first for a few minutes. Taking the time to cook the smoked sausage a little bit first makes all the difference in the taste. I promise! Don’t skip that step. Once the smoked sausage is cooked, insert the corn dog stick into each section. (Tip: We have a bag of chopsticks a friend passed along that are perfect for corn dogs.) 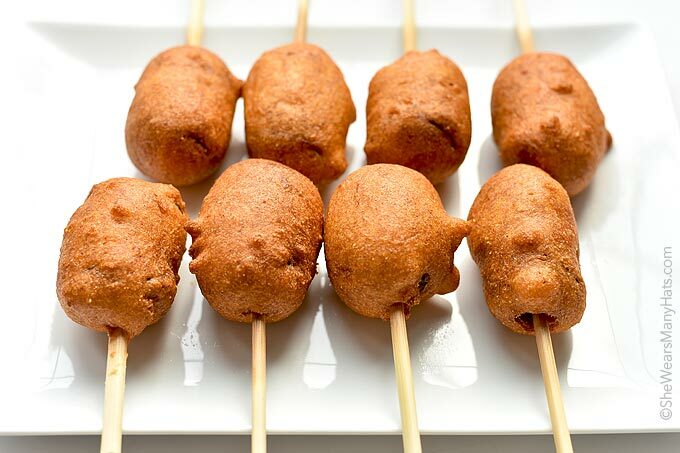 Coat the skewered sausage with a bit of flour, then batter em up and fry those babies up. Be sure to have the mustard ready because these Smoked Sausage Corn Dogs will be gobbled up as soon as they are cool enough to eat. I’m telling ya, good eats, y’all. Worth an extra lap or two. Totally. 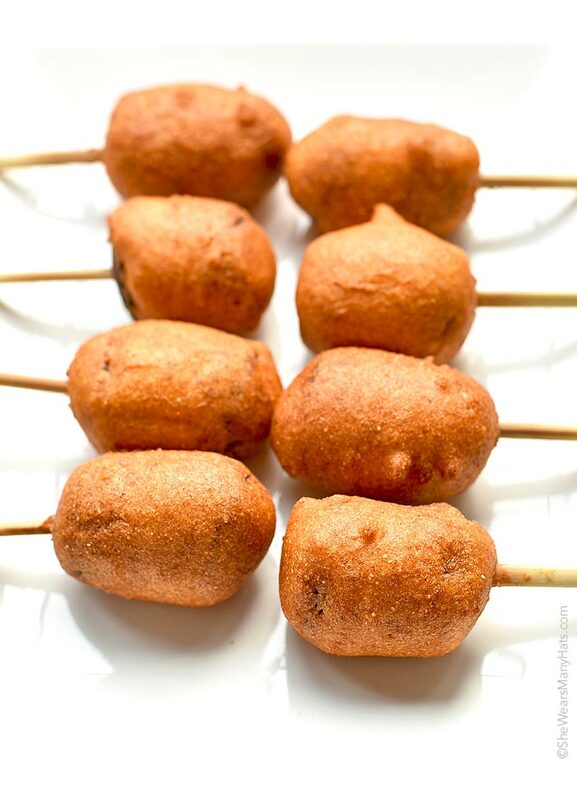 These delicious corn dogs made with smoked sausage are perfect for a main dish or appetizers. Heat up broiler in oven. Spread smoked sausage on baking sheet and broil for about 3-4 minutes. (Or cook smoked sausage stovetop in a hot skillet until warmed.) 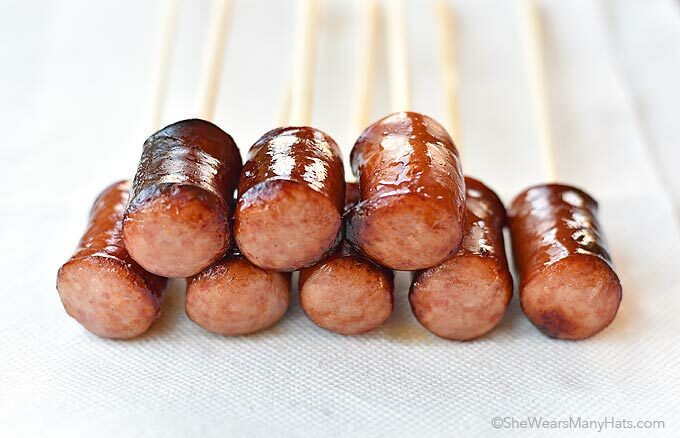 Remove from oven, insert wooden skewer/chopstick into each smoked sausage piece. Spread 1/4 all-purpose flour in a dish, and roll each sausage in flour to lightly coat. Set aside. In a mixing bowl combine remaining flour, cornmeal, baking powder, baking soda, sugar, ground red pepper, eggs buttermilk and dill pickle juice until smooth. Heat oil stovetop in a heavy bottom tall-sided pan to 375-degrees F. Oil should be at least 3-inch deep. Dip each skewered sausage in batter to evenly coat. Carefully insert into hot oil and cook 1-2 to minutes each, until golden brown. It has been so long since I’ve had a corn dog. 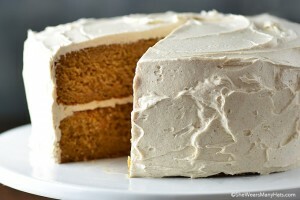 And now I’ve got a craving! 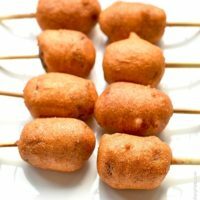 As i browsed this site, the smoked sausage corn dog recipe caught my attention. The pictures were enticing and I knew I had to make them! I just got done making them and I do have some complaints. The recipe doesn’t specify what type of “cornmeal” to use. I remember grocery shopping down the cake mix isle debating on whether to grab the yellow cornmeal mix or the white cornmeal mix. I bought the yellow. After making them, the breading was tasty! FYI, Yellow cornmeal worked perfectly. Another complaint is that the recipe was confusing near the end. Oh honey, bless your heart! I’m so sorry it was confusing to you. Either yellow or white cornmeal works for this recipe. The reference to the oven in the beginning of the recipe is very specific, it has nothing to do with frying at the end, but broiling the sausages first before frying, as it is written. Thank you for sharing your experience with the recipe. For future reference, please note that when frying foods it does not occur in the oven. I will make sure the recipe notes that the oil should be heated stovetop to avoid any confusion in the future. Also, when frying you should always be prepared with tongs or a Chinese spider to retrieve fried foods. Glad to hear that you were able to eventually enjoy them. They are mighty tasty indeed. Thanks so much!